Fans will have the opportunity to see the film early for one day only, onFebruary 6, 2019 at 7:00 p.m.
Paramount Pictures announced on January 19, 2019 that on February 6, 2019, fans at select theaters in the U.S. will have the chance to attend paid "WHAT MEN WANT" Girls’ Night Out Screenings. Fans who participate in this one-day only event will get the chance to grab their friends for a fun night out and see the film on the big screen before it opens nationwide on February 8, 2019. Tickets will be on sale for the prevailing price at participating locations, and each paid admission includes a ticket to the movie, bonus content and a free "WHAT MEN WANT" cocktail glass at all participating theatres - while supplies last. Some circuits will offer special concession deals, specialty beverages themed around the movie and/or more. Offers will vary from circuit to circuit and theatre to theatre. Showtime will be 7:00 p.m. at all participating locations, with 335 theaters participating in over 70 markets. More than 200 of the screenings to take place at theaters with bars and/or with beer/wine & frozen drink service. Tickets go on sale January 18, 2019 at WhatMenWantMovie.com as well as at participating theatre box offices and respective exhibitor ticketing sites. When Ali is passed up for a well-deserved promotion, she questions what else she needs to do to succeed in a man’s world... until she gains the ability to hear men’s thoughts. 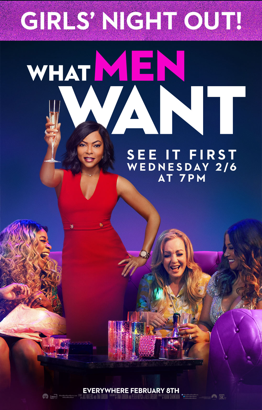 "WHAT MEN WANT" is the latest comedy from director Adam Shankman (HAIRSPRAY) and producers Will Packer and James Lopez (GIRLS TRIP), co-starring Tracy Morgan, Richard Roundtree, Wendi McLendon-Covey, Josh Brener, Tamala Jones, Phoebe Robinson, Max Greenfield, Jason Jones, Brian Bosworth, Chris Witaske and Erykah Badu. The story is by Jas Waters and Tina Gordon, with a screenplay by Tina Gordon and Peter Huyck & Alex Gregory.